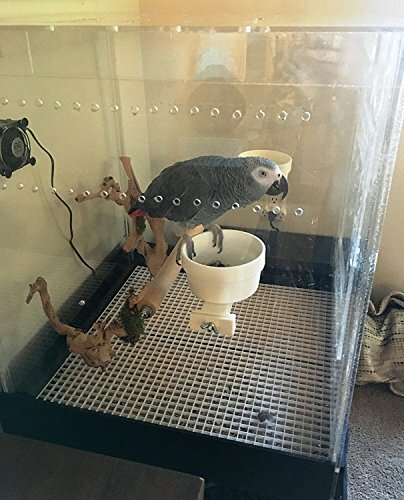 What is the Best Acrylic Bird Cage for Sale? An acrylic bird cage is the best choice for anyone that wants an alternative bird enclosure – one that is visually superior. 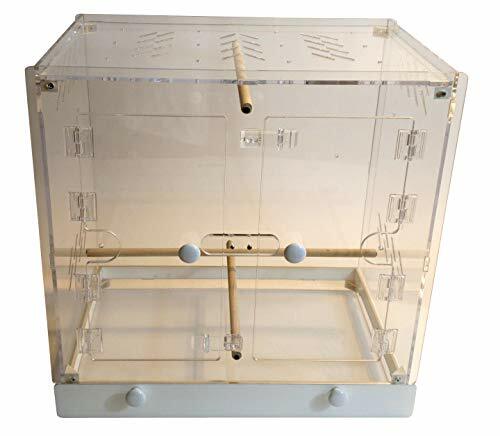 Sometimes called a Plexiglass bird cage, this is the same as acrylic since Plexiglass is simply a brand name of acrylic. Bird owners often say that their pets are happier in these cages as they feel less trapped and are less likely to damage their wings. Plus there are numerous other advantages: easier to clean, more soundproof, longer lasting and are very difficult to scratch, so they are bird safe. When buying an acrylic bird cage the prices tend to be a bit higher in comparison to a traditional bird cage – so you get charged a premium for the advantages of acrylic. However, many believe this to be worth it and you’re unlikely to find any other better type of “clear bird cage” available. The main reason most people buy an acrylic bird cage is because visually it provides a clear view for both you and your birds. To achieve this there are 2 main options: glass or acrylic. Glass bird cages – whilst this might appear like a good option initially, after looking into the details further you realise it’s not a viable option. The main problem with glass bird cages is that they crack and shatter easily. This provides safety problems for you and your birds – plus it raises the likelihood of an escape occurring. The only time when glass is used properly tends to be on much larger glass aviaries that use specially built using reinforced glass. Plexiglass bird cages (aka acrylic bird cages) – is the much more commonly used and more affordable option. It’s fairly durable when dropped or hit so it doesn’t shatter. 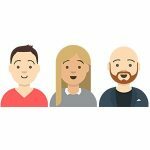 Plus high quality plexiglass is hard to dent or scratch so you don’t need to worry about any birds consuming the material – making it bird safe. 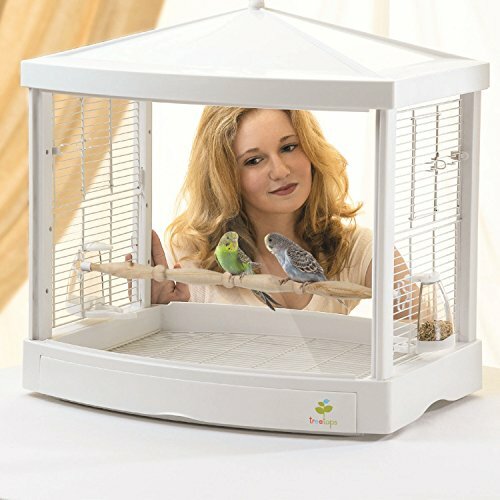 Clearer, better views – Visually, an acrylic cage provides an unobstructed view for your birds that’s more attractive and less jail-like because there are no bars. Happier birds – Many owners report their birds being happier and more calm in acrylic cages. The bar-free views make the birds feel less trapped and so are psychologically better for them. Less wing and feather damage – Some birds catch their wings and feathers between the bars of their bird cages as they move around. This can make some birds appear quite worn out and ragged. These injuries are prevented with acrylic as there is nothing for the birds to catch their feathers on. Easy to clean (with the correct technique) – Whilst some acrylic owner’s report having difficulties cleaning the corners of their cages, in my experience it’s actually easier. You simply need to use the correct products and techniques and then it becomes far easier (see the recommended cleaning product below). Think about it, what’s easier to clean – one large panel or numerous bars individually? 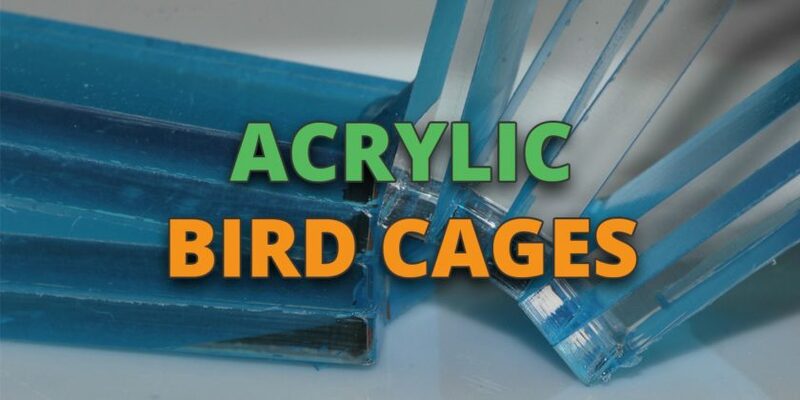 Bird safe material (non-toxic) – It’s a common misconception that acrylic cages are a type of bad ‘plastic’ that have fumes or chemicals left behind on them. Actually, there are no chemicals left on the surface of acrylic bird cages after production and in the unlikely event a bird manages to scratch off small pieces of acrylic to chew on, the material is likely to pass through the bird. Long lasting – High quality acrylic doesn’t degrade easily and can last decades which can easily outlive the lifetime of most birds, plus it doesn’t discolor over time. Child safe – With an acrylic panel on the sides of your cage, a child is unable to place their fingers through the gaps of the bird cage which could potentially hurt both the bird and the child. Less noise – There’s a slight noise reduction when using an acrylic cage due to their being more of a physical barrier, thus preventing sound from travelling out of the cages. Air circulation – A drawback to acrylic panels is that air circulation is reduced. However, a good acrylic cage overcomes this issue by having a top that is well ventilated or multiple holes in the sides of the cage. One bonus to the reduction in air circulation is that your birds will have extra protection against any drafts that you have in your home. Number of wall mounts – Whilst acrylic cages tend to have wall mounts there may not be enough for what you require. Fortunately, acrylic can be easily drilled into if you want to perform some basic DIY, thus allowing you to easily customize your cage and add additional features. Perches & ladders – Without bars on the side of the cage it’s harder for your bird to climb up and down. Some cages have built-in perches or ladders, but if not then you can easily purchase and install your own additional perches and ladders. 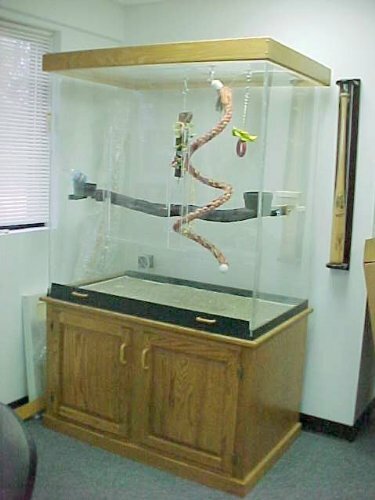 Price – Because acrylic is more of an alternative bird cage material, it tends to be higher priced than normal cages but there are still affordable options still available. Hybrid acrylic cages – Some acrylic cages have 1 or 2 of their sides left as traditional bars or wiring. This allows you to combine to two benefits of the different types of cage whilst reducing the drawbacks of both. Hybrid design that includes both bars and acrylic. Can be used with a floor stand or a wall mount. Modular design mean they can be stackable, so can take off the roof to make them larger. Some users report that the plastic used isn’t of the highest standard. Other issues with users reporting the pieces having to be slightly adjusted so they would fit together. 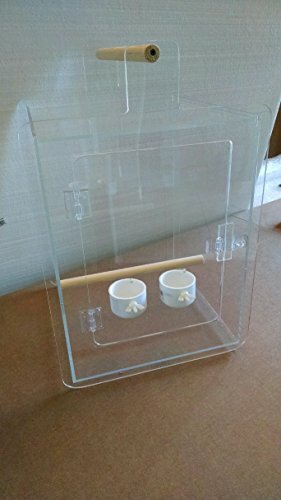 This is by far the cheapest acrylic bird cage available and it’s modular design allows you to stack several cages together to increase the size. However, some cage materials may need additional adjustments if you do end up stacking them. Removable tray for easy clean up. Plenty for holes providing extra ventilation and perfect for fitting additional attachments. Depending upon where you live, the shipping fee is fairly high. A perfect small acrylic bird cage. If your pet birds are on the smaller end of the scale then this is for you. Easy removable trays and sliding doors for easy access. Doesn’t come furnished with internal perches and features, so must also be bought. No pre-drilled holes (although this could be seen as an advantage). Instead comes with a video on how to drill your own holes. This is for you if you just want an acrylic frame which is empty and from which you can install your own perches and accessories. Beautiful cage – one of the best looking furniture bird cages on the market. No holes but these can be provided at no additional cost upon request if you need extra ventilation and perches. Large sliding door is easy to open and provides plenty of space for larger birds. Storage base requires an addition purchase which is available here in wood color or here in black color. For those that want an extra large acrylic cage that’s beautiful and provides ample space. Clear views through the travel cage provides your birds with less stress as they are moving around their environment. If needs arise then cover with a cloth. Comes with feeding tray, watering tray and perch. Available in 2 different sizes for different sized birds. Hard to take apart and put back together again. This is for people that want a high end bird travel cage – one that is clear and allows your bird to easily see it’s environment as it travels. There’s a number of acrylic bird feeders that have been designed to attach to the side or inside of your cage. The main benefits of these feeders is that you can easily see how much feed is left. Plus it compliments your existing acrylic cage design. The above acrylic bird feeder can be found here. There are multiple bite-resistant acrylic bird toys such as the one above that are available for your bird to play with including ladders, swings and foraging boxes. The no.1 mistake people make when looking after acrylic cages is the incorrect use of cleaning solutions. The NOVUS cleaning kit pictured above is both bird safe and able to keep your acrylic cage clean. Combining a bird cage liner at the bottom of your bird enclosure will also make cleaning tasks far easier. I have a macaw, African gray and umbrella cockatoo Looking into acrylic cages for each. They spent time out of their cages all day but like perching on top of their cages. I’m looking for a acrylic cage with at least one wire side so they can climb up the cage any suggestions? Thanks! This cage here has a grid for climbing on one side of the cage but would only work for smaller sized birds. For larger birds such as Macaw’s I don’t know of any acrylic cages with this design. You could look at the aviary building guide which might be able to give you some ideas.